Winter is coming. And every student at Samuelson Elementary School is now ready, thanks to a generous donation by UnitedHealthcare. 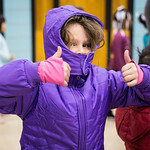 Students took a break from classes on Friday morning to pick out a new winter coats, having to decide on their own a favorite color and getting help from volunteers to make sure the fit was right. The donation by UnitedHealthcare is one of several they have made to schools in cities across Iowa.